Rosette Diceless is an approach to roleplaying that focuses on collaborative storytelling and consent-based conflict resolution. You can roleplay everything from complex combat to intricate political debate with the same set of simple, quick-playing rules that work equally well for a tabletop game as they do for a LARP. 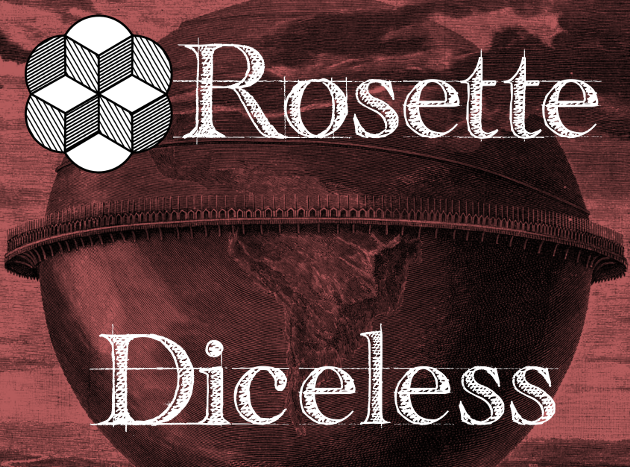 With Rosette Diceless you can take part in games with many more players than are practical for many roleplaying systems. You can easily split into groups without dividing the attention of a single game master. There's no randomness; challenge resolution is simple and based on resource expenditure, understanding your target's strategies, and setting up story to enable your success. 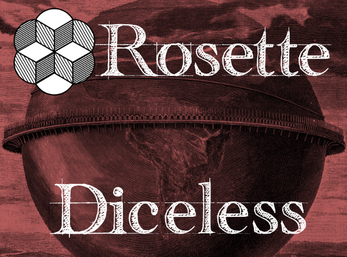 As with the rest of Rosette, Rosette Diceless has an agenda: it is dedicated to a consensus-based, story-first, and improvisational approach. We believe that this creates the best social environment for creating and expressing stories that incorporate everyone's creativity. Rosette Diceless is a complete, standalone book containing the core principles, character creation and advancement rules, conflict resolution system, and story-running techniques for GM-less games. It has the same principles and "pick up and play" style as the other Rosette books, but the other books are a separate system.